This is an adult romance – more plot and character than strictly erotica. Alpha males and a light theme of reluctance is central to the story line. 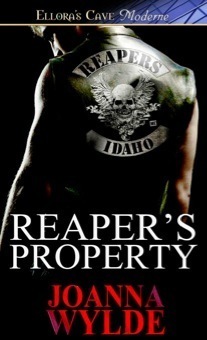 I really enjoyed the world of the Reapers MC that Joanna Wylde created. Her characters were interesting and the plot was well thought out. There were elements of danger and betrayal that added tension to the plot. Much better quality than many adult romances that I have downloaded on my Kindle. I found her take on women in the MC world and the different ways that this was delivered to the reader well done. The reader sees it from an outsider’s, Maria’s, perspective, from long time Old Ladies and sweet butts points of view and from members themselves. That part was particularly well done. The romance had the prerequisite Happily Ever After ending that I look for when I’m buying a romance. The couple was well matched and a pair that you will really root for throughout the story. The next one in the series comes out in January and I already pre-ordered on my Kindle. So a perfect book for Sundays in Bed. This entry was posted in Book Reviews and tagged meme, romance, Sons of Anarchy.